(Bloomberg) -- Things were looking good for Asian stocks up to Thursday. Then crude entered a bear market and Chinese tech stocks plunged. Just like that, the region’s equity benchmark erased weekly gains and is now heading for a sixth slide in seven weeks, only worsening the wipeout that already erased $4.3 trillion of market value this year. Of note: energy companies are, by far, the biggest decliners, followed by tech shares as Tencent Holdings sank 4 percent. Watch for its quarterly results next week -- analysts expect the giant will report its slowest revenue increase in more than three years. Also throwing some shade to the short-lived optimism is the U.S. dollar, which resumed its rise as the Federal Reserve signaled it’s still ready to increase rates in December. The strong greenback has been a key concern for investors in the region, as it’s weakened local currencies and triggered massive outflows from emerging-market assets. China’s factory inflation slowed for a fourth month while consumer prices steadied amid sluggish demand. The nation is also aiming to boost large banks’ loans to private companies to at least one-third of new corporate lending, said Guo Shuqing, chairman of the China Banking and Insurance Regulatory Commission. Australia’s central bank said it expects stronger growth and hiring to help lift inflation, but warned of risks to the global outlook from a worsening trade war and weaker China. Malaysia’s industrial production rose 2.3 percent in September from a year earlier, matching projections, while data on Indonesia’s current-account balance is due later. 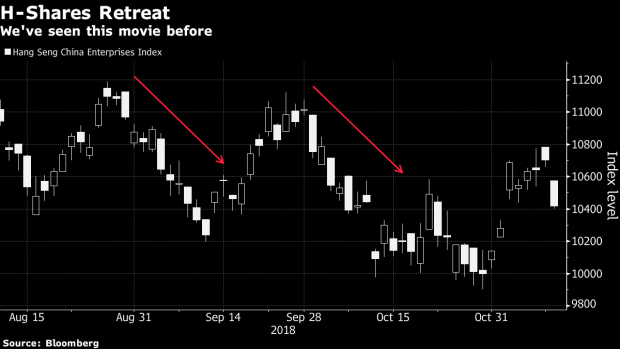 Indonesia’s Jakarta Composite Index also slumped by more than 1 percent amid concerns that a rebalancing of indexes will lead to the lower weighting of some companies. AAC Technologies fell as much as 6.2 percent as Morgan Stanley and other banks cut their ratings on the stock, following disappointing third-quarter results. Nexon, one of the biggest foreign video-game publishers in China, sank after saying profits in the mainland will drop by about a fifth in the current quarter. Lenovo rallied a much as 6.3 percent. The company’s quarterly profit beat estimates after the Chinese company reclaimed the top spot in the global PC market. Alibaba will hold its annual Singles’ Day online-shopping event on Nov. 11. China money supply and new-yuan loans data will be released any time through Nov. 15. Asean Summit begins in Singapore, with leaders from 10 member countries, along with China, the U.S., Japan and Russia. Japan GDP and industrial production data are due Nov. 14. Companies including Tencent, Mitsubishi UFJ Financial, Want Want China, Singapore Airlines will report earnings next week.